Flow cytometric analysis of HCT 116 cells, treated with Staurosporine #9953 (1 uM, 4 hr; blue) or TPA #4174 (200 nM, 30 min; green), using Phospho-Bad (Ser112) (40A9) Rabbit mAb (PE Conjugate) (solid lines) or concentration-matched Rabbit (DA1E) mAb IgG XP® Isotype Control (PE Conjugate) #5742 (dashed lines). Supplied in PBS (pH 7.2), less than 0.1% sodium azide and 2 mg/ml BSA. Store at 4°C. Do not aliquot the antibodies. Protect from light. Do not freeze. 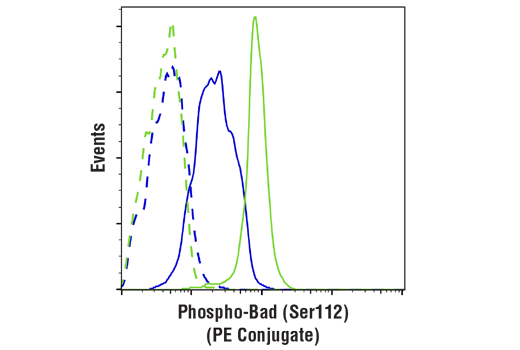 Phospho-Bad (Ser112) (40A9) Rabbit mAb (PE Conjugate) detects endogenous levels of Bad only when phosphorylated at Ser112. The Ser112 nomenclature is based upon the mouse sequence. The analogous phosphorylation site is Ser75 in human and Ser113 in rat. This antibody does not detect Bad phosphorylated at other sites, nor does it detect related family members. Monoclonal antibody is produced by immunizing animals with a synthetic phosphopeptide corresponding to residues surrounding Ser112 of mouse Bad. This Cell Signaling Technology antibody is conjugated to phycoerythrin (PE) and tested in-house for direct flow cytometry analysis in monkey cells. The antibody is expected to exhibit the same species cross-reactivity as the unconjugated Phospho-Bad (Ser112) (40A9) Rabbit mAb #5284. Bad is a proapoptotic member of the Bcl-2 family that promotes cell death by displacing Bax from binding to Bcl-2 and Bcl-xL (1,2). Survival factors, such as IL-3, inhibit the apoptotic activity of Bad by activating intracellular signaling pathways that result in the phosphorylation of Bad at Ser112 and Ser136 (2). Phosphorylation at these sites promotes binding of Bad to 14-3-3 proteins to prevent an association between Bad with Bcl-2 and Bcl-xL (2). Akt phosphorylates Bad at Ser136 to promote cell survival (3,4). Bad is phosphorylated at Ser112 both in vivo and in vitro by p90RSK (5,6) and mitochondria-anchored PKA (7). Phosphorylation at Ser155 in the BH3 domain by PKA plays a critical role in blocking the dimerization of Bad and Bcl-xL (8-10). Yang, E. et al. (1995) Cell 80, 285-291. Zha, J. et al. (1996) Cell 87, 619-628. Datta, S.R. et al. (1997) Cell 91, 231-241. Peso, L. et al. (1997) Science 278, 687-689. Bonni, A. et al. (1999) Science 286, 1358-1362. Tan, Y. et al. (1999) J. Biol. Chem. 274, 34859-34867. Harada, H. et al. (1999) Mol. Cell 3, 413-422. Tan, Y. et al. (2000) J. Biol. Chem. 275, 25865-25869. Lizcano, J. et al. (2000) Biochem. J. 349, 547-557. Datta, S. et al. (2000) Mol. Cell 6, 41-51.